Take a trip back to Jill Evans´™ hometown of Bakersfield in Cake Mania Main Street™, the highly anticipated fourth chapter in one of the most popular time management series of all-time. Help Jill and her closest friends earn enough money to revitalize Main Street by opening, managing, and upgrading four unique downtown shops and building must-see tourist attractions. 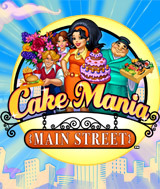 With all-new shop mechanics, 50 shop equipment upgrades, 40 unique mouth-watering recipes, and hilarious new customers, Cake Mania Main Street offers players four truly addictive time management games in one.